Oromia and Ethiopia is one of various text layout/formatting and index projects done for the sister companies, Africa World Press and The Red Sea Press, Trenton New Jersey. The books of the projects are all available for order on the companies’ website- http://www.africaworldpressbooks.com/servlet/StoreFront and all major online retail stores including amazon.com and Barnes and Noble. This original work traces the cultural and political history of the Oromo, their colonization and incorporation into the modern state of Ethiopia and the racialized/ethnicized capitalist world system, and their long struggle for self-determination and democracy. It further illustrates how facing state terrorism, genocide, and gross human rights violations in the twenty-first century from the Tigrayan-led Ethiopian government has increased the commitment of the Oromo to determine their destiny as a nation. Focusing on the development of the class and nation-class contradictions manifested in the continuing crisis of the Ethiopian state, Jalata examines why the reorganization of that state in the 1970s and again in the 1990s failed to change the nature of Ethiopian colonialism. He challenges the assumptions of many modernization and mainstream Marxist theories that colonized peoples like the Oromo would disappear through a process of assimilation. To the contrary, the Oromo case serves as an apt demonstration that colonialism and imperialism have not been successful in destroying the cultural identity of colonized people, nor their desire for self-determination and democracy. "Jalata provides a valuable study of the rise of Oromo ethnonationalism, and its deepening struggle with the Ethiopian state." "The theme of the book reflects a worldwide proclivity for a redifinition of ethnicity. Useful for students of comparative ethnicity and nationalities." "Dr. Jalata has written a brilliant history of Oromia and its relations with Abyssinia (Ethiopia) from the point of view of the Oromo, whose voice has been omitted from Ethiopian historiography. In terms of clear articulation of the rich and wide use of Oromo sources, [and] careful interpretation of data the book is an excellent antidote to Ethiopian historiography. 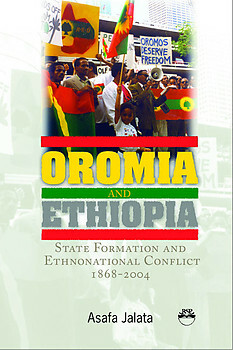 . . this book explodes many myths about Ethiopia while placing Oromia on the intellectual map of the international community." ASAFA JALATA is Professor of Sociology, Global Studies, and Africana Studies at the University of Tennessee, Knoxville. He has authored two books and edited two collections of essays, including, "State Crises, Globalisation, and National Movements in North-East Africa" (2004), "Fighting Against the Injustice of the State and Globalization: Comparing the African American and Oromo Movements" (2001), and "Oromo Nationalism and the Ethiopian Discourse: The Search for Freedom and Democracy" (1998). He also has to his credit over two-dozen book chapters and refereed articles. He is currently researching for a new book titled "Faces of Terrorism in the Age of Globalization: From Christopher Columbus to Osama bin Laden."